JEE Main 2018 Admit Card will be available from 2nd week of March 2018. the Candidates who are seeking to admission into undergraduate engineering courses from top recognized institutions. JEE Main is the one of the best path for them. Joint Entrance examination is the national level engineering entrance exam. It is conducted by CBSE for admission into the B.E./B.Tech and B.Arch./B.Plan. courses which is offered by the IIITs (Indian Institute of Information Technology), IITs (Indian Institute of technology), NITs (National Institute of Technology) and CFTs (Centrally Funded Institutions). JEE Main registration process has been began from 1st December 2017 and till continue 1 January 2018. JEE Mains Result for Paper 2 Released Click here check result. JEE Main online application form has been released by the CBSE. The following documents are mandatory to carry for students when they are going to fill JEE Main Application Form. Credit/Debit Card for fee payment/ offline mode payment candidates need to generate e-challan. Slot booking facility will only provides those whose exam mode will be online. 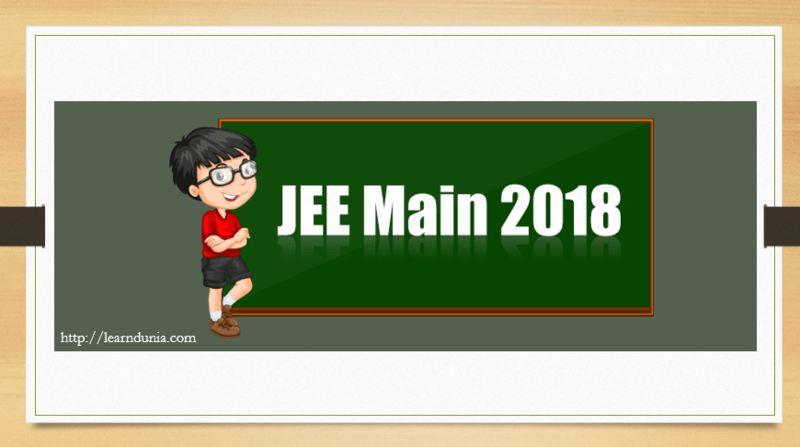 JEE Main 2018 Registration Process has been started from 1st December 2017. Remove discrepancy from the uploaded images has been began from 8th December 2017. CBSE already declared JEE Main mock test for online mode exam on 13th December 2017. JEE Main exam dates has been released on 22nd November 2017. MHRD, Government of India Introduced some new changes into the JEE Main Examination. In last year only 148 Exam centers avaliable for JEE Main but from this year JEE Main Exam Centers has been increased i.e. 258 Centers, 248 are Indian Cities and 10 Out side India. CBSE also announces a news and very important changes from this year a diabetics students can take sugar tablets and eatablets, Fruits like apple, banana, and transparent bottle. Students who are picked online mode examination can pic their exam slot according to their preference. From 2017 no weighatge will be given to class 12th marks when calculating JEE Main All India Ranks. Candidates who want to admission into the IITs, NITs, CFTs must have secured 75% marks into the qualifying examination (For SC only 65%) or in top 20% in class 12th examination from their respected boards. Candidates from Meghalaya, J & K and Assam are excluded from this provision, can fill their passport number, ration card number, bank account number or any other valid Govt. identity number into the application form to get examination centre in these states only. Candidates need to fill the JEE Main application form via online mode only. Registration process has been started from 1st December 2017. A candidates apply for JEE Main, if they have Aadhaar Number/Aadhaar Enrollment Number/Registration Number which will be provided by facilitation center. For future purpose a candidates need to take a printout of acknowledgement page. Corrections is allowed in uploaded images (signature and photograph). Images discrepancy in uploaded images has been started from 8th December via online mode. JEE Main Admit Card kb release hoga?